The Jaguars are expected to name John DeFilippo as the offensive coordinator on Wednesday. Jaguars coach Doug Marrone will announce the hire at 3 p.m. 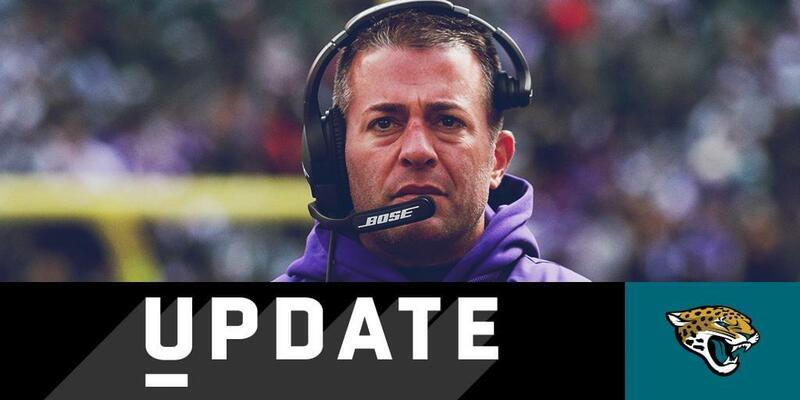 The 40-year-old DeFilippo was fired from the same post with the Minnesota Vikings this past season, but has a reputation as a passing-game specialist. Vikings quarterback Kirk Cousins completed 70.1 percent of his passes, throwing for 30 touchdowns and 10 interceptions this season for a passer rating of 99.7. The Vikings running game never got on track, as running back Dalvin Cook was hampered by injury and only logged 133 carries. DeFilippo replaces Nathaniel Hackett, who was fired on Nov. 26. DeFilippo’s best work came in Philadelphia where he served as quarterbacks coach for two seasons in 2016-17. The Eagles won the Super Bowl last season with Carson Wentz and Nick Foles both enjoying success. Wentz was well on his way to the MVP award when he suffered a season-ending knee injury in the 14th game. Wentz threw for 33 touchdowns and seven interceptions as the Eagles began the season 11-2. Foles came in and delivered one of the most surprising postseason success stories in NFL history. He threw for 725 combined yards and six touchdowns in playoff wins over the Vikings and New England Patriots to claim Super Bowl MVP honors. Foles is expected to be available this off-season. DeFilippo’s presence with the Jaguars strengthens the possibility of Jaguars personnel chief Tom Coughlin making an aggressive play for Foles to replace starter Blake Bortles. Coughlin gave DeFilippo his first NFL job, hiring him to be an offensive quality control coach in 2005-06. The Raiders then hired DeFilippo as their quarterbacks coach, where he spent two seasons. In addition to this past season, DeFilippo has one other year of play-calling experience in the NFL. He served as Cleveland’s offensive coordinator in 2015. The Browns went 3-13 under head coach Mike Pettine, a defensive-minded coach. DeFilippo had three different quarterbacks start that season: Josh McCown (eight), Johnny Manziel (six) and Austin Davis (two). The Browns trio combined for 20 touchdown passes and 12 picks.